Originally from Corpus Christi and currently a resident of the Rio Grande Valley, Luis Corpus has decided to generate awareness of the situation DACA recipients currently face through his portraiture artwork. As an educator in South Texas, Luis has been able to witness the hardships that DACA recipients experience first hand with his own students. Luis mentioned in an interview with the Monitor, "I was working out in [a local high school] and I saw it first hand—some of the best students, and they had no path. I began drawing nothing but DACA recipients—all former students." ​There are currently close to 700,000 DACA recipients who have been in a state of political limbo since September of 2017, when Donald Trump decided to rescind Deferred Action for Childhood Arrivals. Luis Corpus has since decided to present some of the faces affected by this decision through his artwork—to remind us that we are dealing with real human beings and real lives. As a symbolic medium in his artwork, Luis collects the elements of the border. Using charred branches and water from the Rio Grande to depict the energy and positivity of the Rio Grande Valley youth, he creates magnificent works of art that speak volumes of our current social and political state—a work that captures the spiritual struggle of 21st century America. Luis' work is also a reminder that there is only one way to urgently assist the thousands of DACA youth in our communities who are facing the effects of cruel policies, and that is to vote—to make sure we vote out anyone who is willing to harm the youth in our community (friends, family and neighbors), and elect officials who will boldly defend our community through thoughtful and humane legislation. 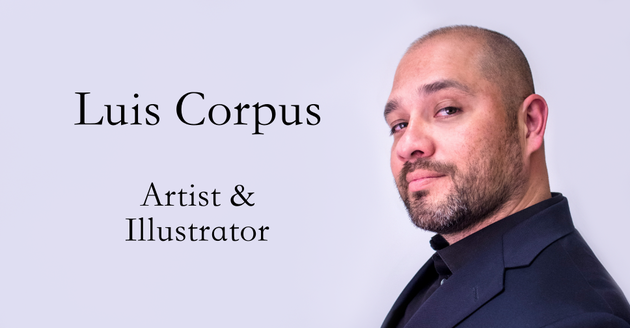 Luis Corpus graduated in 2009 from Texas A&M University-Corpus Christi with a Master’s degree in Studio Art, and is currently working as an Art instructor at South Texas College. Prior to his work as an Art educator, Luis was in the United States Marine Corps.